The oceans, and the challenges they face, are so vast that it’s easy to feel powerless to protect them. 50 Ways to Save the Ocean focuses on practical, easily-implemented actions everyone can take to protect and conserve this vital resource: what fish should and should not be eaten; how and where to vacation; storm drains and driveway run-off; protecting local water tables; proper diving, surfing, and tide pool etiquette; and supporting local marine education. 50 Ways also looks at what can be done to stir the waters of seemingly daunting issues such as toxic pollutant runoff; protecting wetlands and sanctuaries; keeping oil rigs off shore; saving reef environments; and replenishing fish reserves. 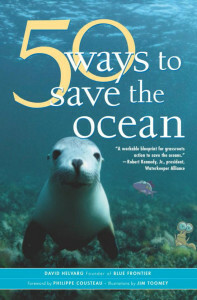 This book is an excellent read for anyone interested in learning how to make his or her life more ocean friendly. It is also a fun book for the classroom that can be used to educate children about their impact on the 71% of our blue planet. Presentations – Interested in having David and Jim present 50 Ways to Save the Ocean at your event? Contact us. Check out our educational materials which help adapt the book into classroom friendly material. Students Saving the Ocean: 50 Ways in San Francisco Bay Area classrooms resulted in this video project. 6. Maintain an earth (and ocean) friendly Driveway. If that works try a Green Roof. 45. Join an ocean expedition from your home computer or in person.